The Barcza half of the defence. Black exchanges at once, consistent with his plan of getting on to e5. To answer 9 P-R5 with 9 . . . P-QN4, but being rather casual about getting his pieces moved off the first rank. Following the recipe of Gligorii, who got to c4 via a3. Setting a devilish trap and just willing the black knight to e5. N-B4 0-0 13 B-B4 N-Kl 14 Q-K2 B-B3 15 R-R3! P-QN4 16 NxP NxN 17 BxN R-Kl (17 . .. BxP 18R-K3!) 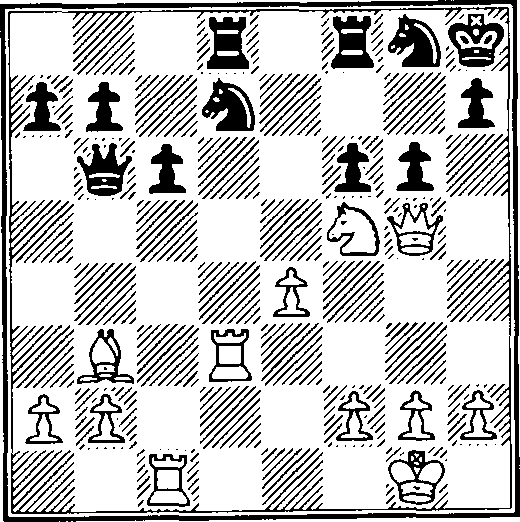 18R-K3 RxR 19QxR with a winning position is an example of the difficulties Black finds himself in. However, the move played is nicely dealt with by Karpov. The start of something big - this pawn goes down in a blaze of glory to open not only the bishop's diagonal but also the file for the queen. 13...R-B1 14 PxB Q xP 15 N-B4 or 13 . . . R-R2 14 B-B6+ are clearly good for White. 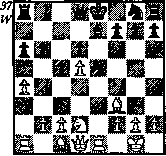 14B-B6+ This zwischenschach puts out any ideas Black may have had of castling. (cl) 18 . . . Q-Q4 19 NxNP Q~ Q5+ 20 K-Rl N-R3 21 P-B3 winning the queen in mid-board. (c2) 18 ... K-K3 19 P xP B xP 20 B-B4 Q-B2 21 R-Kl. In every case the exposed black king, left in the centre because of Black's slow development, is the cause of the trouble. 16 N-B4 B-B2 Forced, to cover the QNP, but now White gets ready to soften up the QBP. 17 B-K3! Preparing his next move. 17 . . . Q-B3 is nicely met by 18 P-R5! P-QN4 19 NxP BxN 20 Q-Q8 + Q-Kl 21 BxP+ N-K2 22 BxN+. (c) the break up and destruction of the weakened Q-side pawn chain. 19 N-N6! BxN (19 . . . Q-B3 20 BxP K-Kl -not 20... QxB?? 21 JV-Q7H--still leaves Black helpless) 20 PxB P-B3 21 Q-Q7 K-B2 22 BxP R-Kl (or if here 22 . . . Q-Ql 23 R-Ql Q xQ 24 R XQ R-K1 25 RxN+! and the QNP is decisive) 23 P-N7 Q-Nl 24 RxP with 25 R-R8 to follow. (b) 19... Q-Kl 20 Q-B3! K-Nl 21 Q-N7 Q-B3 22 NxRP! QxQ (22 ... BxN 23 Q xN) 23 N xQ N-N3 24 R X P and the connected passed pawns are too strong. 20 ... BxN 21 Q-Q8+ Q-Kl 22 BxN-)- and it's time to put the pieces back in their starting positions. Protecting his knight which was now threatened, and preparing the entry of the white rook.